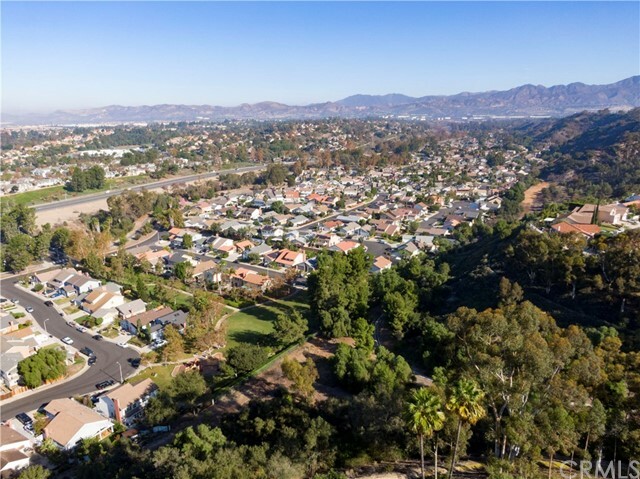 All Mission Viejo homes currently listed for sale in Mission Viejo as of 04/22/2019 are shown below. You can change the search criteria at any time by pressing the 'Change Search' button below. "Remodeled lakefront point property!! 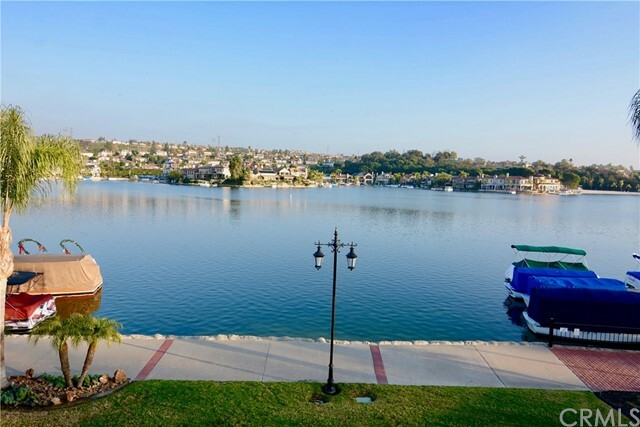 One of the most spectacular waterfront locations on Lake Mission Viejo!! Custom built w/nearly 4800 sq ft of quality living space consisting of 5 BR's plus bonus room! Sweeping 180 degree lakefront views from most rooms! An absolutely gorgeous interior and exterior remodel recently completed. High quality fixtures and finishes throughout w/beautiful soft neutral tones. Chef's kitchen w/center island, slabs of stone, Jenn-Air Range, Jennair BI frig & stainless appliances, travertine floors, breakfast nook w/built-in desk & more! Double doors open to a resort style master suite w/cozy FP, custom remodeled bathroom with his/hers sinks, new stone shower, soaking tub, extensive use of natural stone, walk-in closet w/built-ins & retreat/office w/FP. Beautiful flooring t-out incl distressed wood, travertine & quality carpet. Also includes all new pex plumbing, new electrical, new windows, new doors, new beautiful wood flooring, climate control house fan, dual furnace & AC units, epoxy garage, automatic awnings & more! The outdoor living space is an entertainer's dream w/professional grounds, lakeside balcony, large covered patio w/ceiling fans & newer spa, low maintenance yard w/custom stone synthetic turf & a large boat dock! End of cul-de-sac location. Tres Vistas is a gated, lakefront community w/great amenities incl guard gated entrance w/roving security, tennis courts, beach/park & walking trails, private streets & lush greenbelts!" "This wonderfully located home sits on a cul-de-sac between two popular beaches on the lake with its own private dock for tons of fun. The grand foyer invites you to sweep up the grand stair case to a catwalk above the formal dining and living rooms. There are gorgeous wood embellished walls and ceiling in the library and two story ceilings in the formal living areas. The views capture you as you enter the expansive family room with an entertainer s bar overlooked by the spacious kitchen. The upstairs offers a large bonus room for the game table of your choice, also equipped with a bar and built-in book cases. The Master suite features a grand double door entry with a separate sitting area and expansive views of the lake. The master bath offers dual vanities, a private water closet, a roman tub and walk-in shower plus dual closets. A small balcony allows you to step outside and take in your views privately and overlook the two-tiered yard. Outside features a large patio with built-in BBQ and a pool and spa on one level and a lower lever at dockside for a afternoon dip or lounging on the water front patio." "Custom Estate. Magnificent Private Double-Gated Estate in Exclusive Canyon Crest. Spectacular Vistas from Dramatic Sunsets to Fireworks all over OC & Demanding Mountain Views. Shown as 4-BR with Apt. Suite but Apt Living Room is actually 5th BR & has huge Walk In Closet. Could Be a 6-BR as the Loft Area is a possible 6th BR or Office. Double Entry Doors welcomes You into a Grand Foyer with 2-Story Ceiling and sweeping Staircase. 'Lodge' Style Living Room w/ Soaring Ceilings, Main Floor Game Room with Fireplace and full walk behind Bar with Wine Cellar. Large formal Dinning room with built in curio. Gourmet Kitchen w/granite counters, center island, built in Fridge / Freezer, Desk area and a huge walk in pantry. Note the Barn Doors to the Pantry are Originally the Shutters from the F Scott's Fitzgerald's home in Great Neck in NY. Indoor / Outdoor Living. Kitchen and all bathrooms remodeled. Hardscape, fire-pit, built-in in barbeque and putting green all added. The 2nd level 1 bedroom, 1 bath, living room & kitchenette apartment with internal and external access. Privacy gated home in a gated community. Oversize extended 3 car garage with huge attic. City records are in error regarding Square Footage. It's been taped many times at 4900 - 5100 SF. 2017 remodel to add a fabulous 2nd level large deck with incredible panoramic views of the Saddleback Mountains plus an outdoor California Room with fan, heaters, BBQ, TV, etc. to experience the best in outdoor living." "Located in prestigious, well sought-after, 24-hour guard-gated Canyon Estates Community. This turnkey executive home features 4 spacious en-suite bedrooms, in-ground pool & spa, a grand kitchen with large center island, stainless steel appliances, stainless steel backsplash; upgraded floorings throughout, vaulted ceilings, Master Bedroom retreat, downstairs en-suite bedroom. VEry open floor plan. A fabulous home for large or small families with generous space for entertaining. Enjoy association amenities; Tennis Courts, Sports Court, Basketball Court, Swimming Pool, Lap Pool, Spa, Gym, BBQ Areas, playground and the Clubhouse to hold your special events. Membership with Lake Mission Viejo Association; amenities include Summer Concerts and Movie Nights, Fishing, Boating, picnics as well as venue for hosting your special events. You will love this home in this great community!" "QUALITY, STYLE & WARMTH exude frm this Custom home located in the West Cliff area behind the guard-gated enclave of Canyon Crest. This custom home on a private lot nestled in a small cul-de-sac is perfectly suited for family enjoyment & for formal & informal get togethers. The spacious living rm with its stunning fireplace & dining rm are perfect for entertaining. The inviting kitchen has full amenities, including a center island, breakfast nook, & combined with the adjacent family rm & it's large fireplace, is the heart of the home. The 2nd level contains an expansive media/family rm tailor made for famly & friends to gather. The master suite is a wonderful retreat with a spa inspired bathrm. Secondary bedrooms are airy & generous in size. Everywhere you look, from the beautiful wood floors to the custom crafted wrought iron staircase, the generous use of granite, & the attention to detail will delight you! The custom features and attention to detail does not stop with the interior!! The back yard features a stunning pool, with water feature & outdoor cook center - Entertainment at its best! The community of Canyon Crest offers fine amenities, including a club house, banquet rm, gym facilities, resort style pool area, tennis courts, and Lake Mission Viejo membership included. The present owners found a lovely Custom home & invested approx $124,000 to further enhance an already lovely hm. Every detail large & small has been given the same careful attention.. and it shows." "The very best of all Canyon Crest Estates' is now available! This property is worth at least $500K more to build with the amount of money that went into this remodel. EVERYTHING in this home is NEW & UPGRADED. 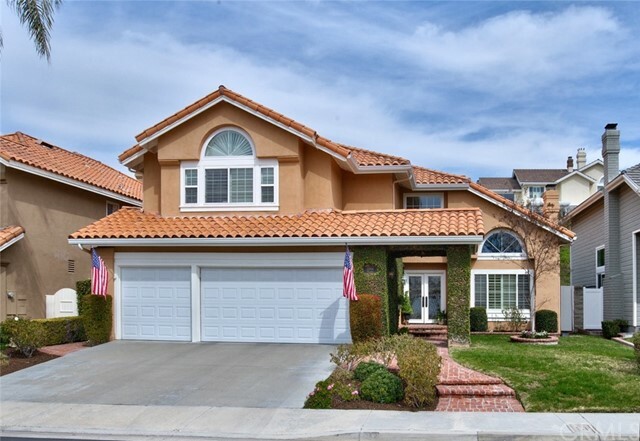 This single family masterpiece is in the prestigious guard gated community of Canyon Crest above Lake Mission Viejo. This world-class trophy home boasts top-of-the-line finishes, spacious bedrooms, spa-quality bathrooms & an oversized 3 car garage. The CUSTOM REMODEL includes: NEW dual glazed windows, NEW solid core doors, NEW siding with architectural enhancements, NEW pex waterlines & plumbing fixtures, NEW custom lighting throughout, NEW motorized roller shades, NEW Master Brand kitchen & bath cabinets with unique stone & tile on shower walls, NEW Thermador appliances, NEW custom closets, NEW custom natural stone mahogany stair rails, & NEW real wood flooring. This ULTRA LUXURY residence offers the very best in terms of value, location, aesthetic, upgrades, & functionality. Your new estate provides a sought after posh resort lifestyle amenities such as multiple swimming pools, jacuzzi, sauna, tennis courts, sport courts, fitness room, billard room, Clubhouse, Parks, & BBQ pits. Additional outdoor amenities include: Mission Viejo Lake privileges with, swimming, boating, & fishing. Close to restaurants, Sports Fields, schools & parks. 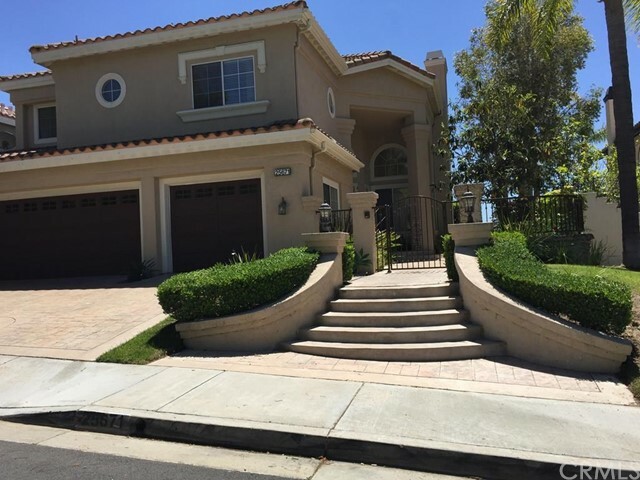 This executive residence is the very best of Orange County LUXURY living! There is not a home in Mission Viejo like it. WELCOME HOME!!!" 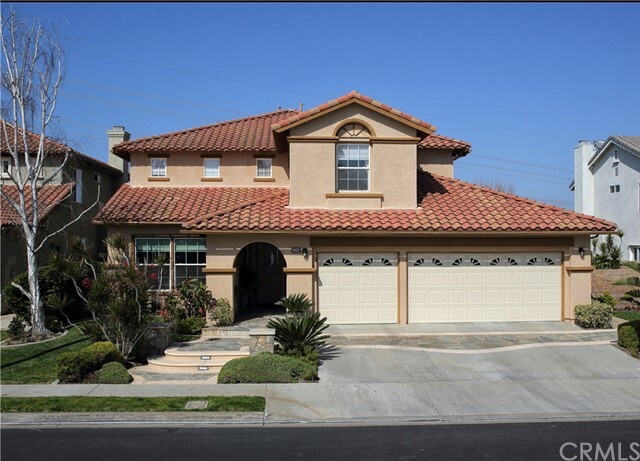 "Within the private gates of Canyon Crest Estates is the home that you have been looking for. One of the largest lots available in Canyon Crest, this home has the upgrades, space, & yard that you need. The highly manicured landscape gives a fresh & 'cared for' look. The 3 car garage & large driveway allows 6 total parking spaces. Walking through the front door, immediately you will notice the high ceilings & spiral staircase. This open floorpan allows you to entertain with ease. The newer wood flooring & the lighter paint invites more natural light throughout the home. The dining room is large enough to host the whole family. This HUGE Kitchen provides: large granite countertops with an island, white cabinets, Stainless steel appliances, & an extra large Breakfast Nook. The DOWNSTAIRS bedroom can be used for guest or as an office. The DOWNSTAIRS full bathroom has been updated. The Master bedroom is large with a nice hillside-neighborhood view. The NEWLY REMODELED Master bathroom is a MUST SEE, with a free standing tub, new cabinets, countertops, & shower. The walk in closet space is large with custom shelves. The three guest bedrooms share another newly REMODELED BATHROOM! The BONUS ROOM has all the space to host the game. The backyard has new custom turf, custom fountain, Covered deck with recessed lighting & fan. The VERY LOW $220 HOA monthly fee covers the GUARD GATE, CLUBHOUSE, POOLS, SPA, GYM, LOCKER ROOMS, TENNIS COURTS, SPORTS COURT, PARK, & LAKE. WELCOME HOME!" "Furniture can be included. Home built 2017;owners second home and hardly lived here.Added even more upgrades if possible after purchase, over 150K including the hardscape, pool,jacuzzi, BBQ. Built ins.Located in Mission Viejo in a tucked away location.This beautiful plan 1 with modern interior design includes: 4 beds, 3 baths, Upgraded KitchenAid appliance ,5-Burner Gas Cooktop & canopy hood, Dishwasher with Clean Water System, Double Wall Oven with Even-Heat True Convention Model, 1200 -Watt Countertop Microwave Oven. Upgraded 25.5 cu ft. 42 Width Built-In side by side Refrigerator. Upgraded Kitchen countertop, Island in Bianco Antico Granite with custom ADEX Diamonds Collection 8x4 Beveled White Backsplash. Upgraded Royal Blanc Hanstone @ Owner's Bath Pullmans, Shower Seat & tub deck. Upgraded Backsplash @ Pullmans and Tub Deck in Huntington White Pacific Heights Tile. Upgraded White Thermofoil Cabinets with Shaker Door Style throughout. Upgraded Flooring Independence Heritage Hickory 8 Plank in Foyer, Great & Bonus Room, Kitchen, Pantry Dining, Drop Zone Stairs/Landing and Hall Up 1&2. Upgraded Vincent Bay Oak Beach Carpet at all Bedrooms. Panoramic Style Stacking Door @ Great Room leading to the California Room with included fireplace Beautifully upgraded Secondary Baths. Recessed lighting and ceiling fan pre-wire, Premium Theater and NO MELLO ROOS:LOW HOA"
"Almost brand new home with unobstructed views. Located on a private Cul-de-sac, single loaded street. Shows like a model. 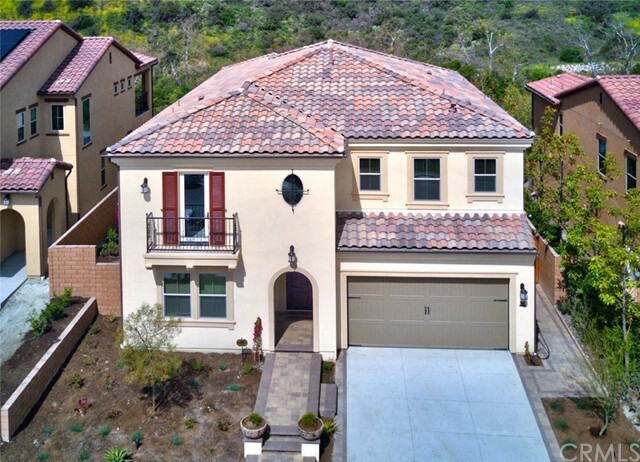 Situated in the newest community of Skyridge in Mission Viejo. This beautiful home has hardly been lived in, tastefully upgraded and appointed throughout. Popular plan 3 with approx. 3300 sqft. Featuring a Grand Oversized Great room with panoramic style doors open to backyard, kitchen and formal dining room. Living room opens to a covered California room with fireplace providing an indoor/outdoor living with unobstructed views. Gourmet Kitchen with granite counters, top of the line Stainless Steel appliances, double ovens, built-in Refrigerator, oversized island with breakfast bar and walk-in-pantry. Neutral Porcelain flooring, neutral paint, custom light fixtures, and upgraded bathrooms throughout. . Spacious main floor bedroom & bathroom. Master Suite with cozy retreat and oversized balcony with endless views. Upgraded Master bath tastefully appointed, offering dual sinks, sunken tub, oversized shower and walk-in closet. Large lot perfect for entertaining." "Welcome to the top of the hill, the pinnacle of prestigious Canyon Crest Estates living! Lovely City Lights & Pastoral Views in 3 directions! This spacious, comfortable Family Home is designed for Indoor/Outdoor Entertaining. From the Paved Entry Court, Stone Floor & Sweeping Staircase, you'll be impressed as soon as you arrive. Start the day with your morning coffee on the raised View Terrace looking at lush green hills. Enjoy planning a menu, prepping, cooking & serving in the wonderful Remodeled Kitchen, spacious enough to have family & friends all around. This is truly the heart of the home. Invite neighbors for a BBQ on the Covered Patio. Watch the game or host movie night with your Built-in Family Rm TV. Have a glass of wine in front of the Outdoor Fireplace or head upstairs to the romantic Master Suite for a bubble bath in the Spa-like Tub or snuggle up with a good book next to the cozy Fireplace, taking in the sparkling City Lights. This is the life! A First Floor Guest Rm and 3/4 Bath provide many options for a changing family. From the 4 FP's, French doors, Stone & Wood Floors, Plantation Shutters, Built-ins & Quality Upgrades Throughout to the rare 4-car garage, this home offers possibilities to each member of the family. Feel at ease knowing you're at the End of a Cul-de-sac in this Guarded Community. Array of Amenities at the Club. Sought-after Top Notch Schools. Near to Lake, Joyner Park, Shopping & Dining. Even peek-a-boo Ocean & Catalina Views on a clear day!" 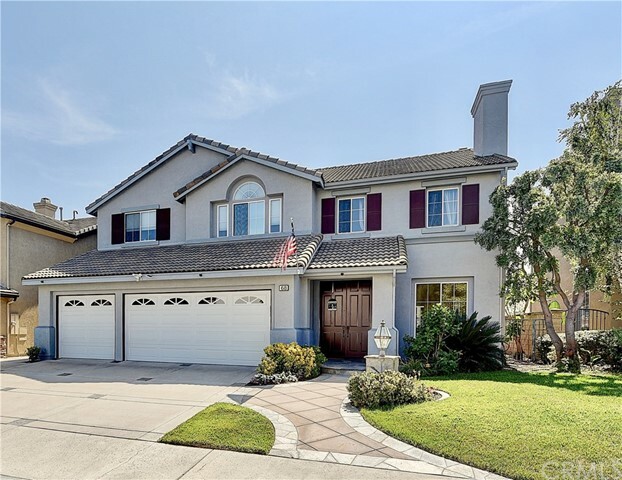 "CANYON CREST ESTATES STUNNER WITH A FRONT ROW VIEW OF LAKE MISSION VIEJO! Beginning with an inviting courtyard, striking sophistication greets you upon entering the two story foyer. A large formal living room and adjoining formal dining room present a wall of windows offering amazing light and a fantastic view of the pool area and Lake beyond. You will love the grand chef s kitchen with a large island featuring a gas cooktop, recessed lighting, granite counters, stainless steel appliances and a built-in refrigerator. This exceptional kitchen also affords a casual eat-in area and a door to the entertainer s pool patio. The adjacent oversized family room with it s cozy fireplace will be the place to entertain and gather. A private downstairs office/bedroom and full bath add to the appeal. The master bedroom presents sweeping Lake views and the ensuite includes a dual sink vanity, a view soaking tub, separate shower and walk-in closet. A large bonus room, two additional spacious bedrooms and a full bath complete the upstairs. The custom pool patio features an outdoor kitchen, an in-ground fire pit, and a must see pool and spa. With designer finishes, updated neutral paint, crown molding, large inside laundry, 3 car garage and a great cul-de-sac location you can't go wrong. Community amenities include 4 gated entrances, club house, pools, tennis courts, gym and play ground. Award winning schools, close to shopping and 241 toll road make this home a must SEE!" "Panoramic Mountain, city and sunset view home in GAURD GATED Community of Stoneridge, Greystone Point largest floor plan, at end of Cul De-Sac, 5 Bedrooms and 4.5 bathrooms, Main floor Bedroom with its own upgraded Bathroom can be used as a guest room, Large office with French door which opens to the side yard garden, hardwood flooring in dining, living, office and hallway, high ceiling, very light, bright ang open floor plan, Gourmet kitchen with large center island, Granite counter tops, upgraded cabinets, large sink , stainless appliances, walking pantry, breakfast area between kitchen and family room, Stone flooring. Awesome family room with fireplace,, stainless appliances, granite countertops, upgraded sink , garden view window, family room French door opens to beautiful view garden, large Mater bedroom with two walking closets, duel sinks, shower and a bath tub with a enjoyable view , Master bedroom has a large Balcony, you can enjoy incredible sunset view every evening from your own private balcony. Entertainment delightful large backyard has Gazebo and lots of siting area and has room to add pool and spa of your dream. Separate Laundry room with cabinets and sink , Security system. Water softener. 3 car garages has been upgraded with epoxy flooring. 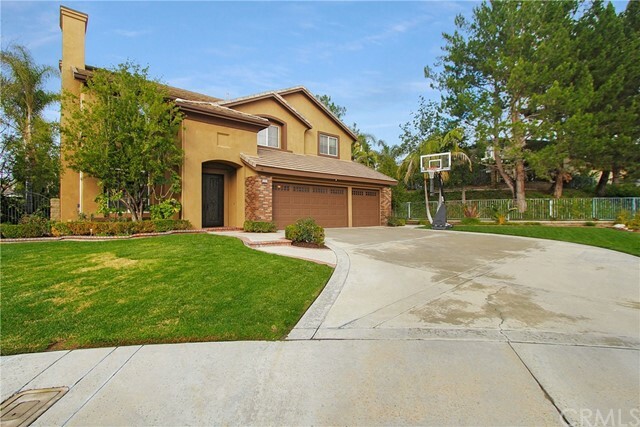 Member of Mission Viejo Lake, close to shopping, Resultant and much more." "VIEWS, VIEWS, VIEWS, VIEWS!!!! Only five houses in this entire area have these gorgeous 260 degrees views. This home has the perfect blend of contemporary and traditional. This extensively remodeled single level with loft home is an absolute rare find with over 3750 square feet of living space. From the moment you walk in to the door you will see attention to detail with vaulted ceilings, beautiful hardwood floors and large baseboards throughout the home. It achieves the perfect balance of modern features with chrome accents as well as the traditional look of the high gloss shiplap ceilings. The kitchen features the designer brand package of Thor. The package comes complete with range stove, refrigerator, range hood, wine cooler and dishwasher. The 14 foot bifold door is a perfect addition to the living room allowing you to open up the space completely for the indoor/outdoor experience. The home boasts 3.5 bathrooms and the master bathroom is truly stunning. The shower and soaking tub are encased with gorgeous marble and the his and hers vanities are a perfect touch. The master bedroom is a generous size and includes its own marble fireplace. The home features plenty of entertaining with two separate areas of floor to vaulted ceiling fireplaces to host guests and family. The home even features a loft which is perfect for an avid reader or as an office space." "Rare Opportunity .Enjoy the ambiance of an unobstructed view with lakefront living at its finest! A special location on a cul-de-sac with extra guest parking just steps from lake access, private boat docks and the lower pool/spa area. 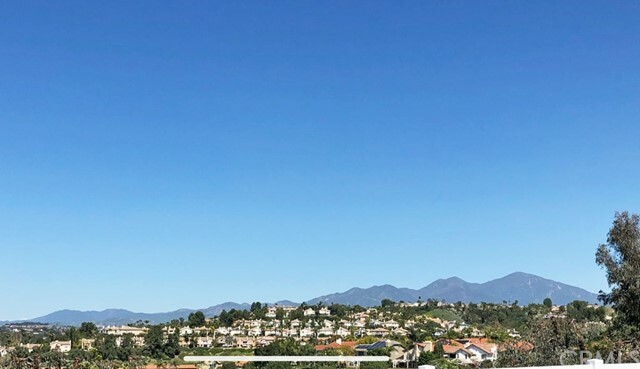 One of the few homes without docks directly in front of it, your panoramic view includes an end-to-end lake experience, East Beach, North Beach, the Oak Preserve, sunrises and majestic Saddleback Mountain views. Perpetual light pours in from the celestial windows facing east (AM sun), South (midday sun) and West (PM sun). This upside down 2 story unit has no one living above or below. On street level is LV, DR, MBR, MB, Kitchen, Nook, and powder room. Downstairs offers a very spacious guest room, third guestroom/office, private patio and full bath. Perfect privacy for visitors! The Mallorca Community offers a 24/7 live gate attendant and private beach." "Gorgeous Executive home was recently remodeled. Move in ready as all the work has been done! Located in the Gated Community of Canyon Crest, this home features a stunning view from the rear of house. Located just North of Lake Mission Viejo, view from the Master Bedroom looks toward the Lake and Ocean. Kitchen has Onyx slab countertops, Stainless Steel Appliances and Custom Cabinets. This Premium location is elevated high above on a single loaded street. Rear yard is perfect for entertaining with a Pool, Spa, Built in BBQ and Patio. Master bedroom and bath are elegantly appointed with a soaking tub and 2 walk in closets. Cozy Fireplace in Master, Living Room and Family Room. Spacious bonus room upstairs could also become a 5th bedroom. Plantation Shutters throughout most of the house. Canyon Crest amenities include pools, spa, clubhouse, tennis and more. Lake Mission Viejo offers 2 swimming beaches, boat rentals, fishing and concerts. Home has dual heat and A/C systems." "HUGE PRICE REDUCTION! Motivated Seller! 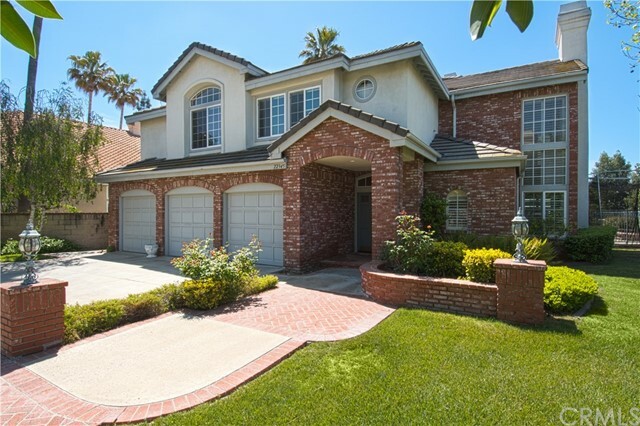 This lovely home has one of the best PANORAMIC VIEWS in South Orange County. Everyone that sees it says WOW! The view changes by the hour. In the Evening you will enjoy many sunsets of various effects and colors! Walk along the side and around to the back of the house to AMAZE YOURSELF by the beauty of the WIDE ANGLE VIEW as far as the eye can see. Situated on a private cul-de-sac, with a neighbor on one side only.The downstairs includes a formal living room, a formal dining room, family room adjoining a large open kitchen which has granite counter tops and built in appliances. LARGE DOORS and WINDOWS throughout the home enable full enjoyment of the breath-taking view. The large fireplace in the family room, combined with a NIGHT-VIEW of lights , will provide many romantic evenings. A bedroom downstairs, currently being used as an office, has an adjoining bath as well as a slider to the side yard,to enjoy the view. All bathrooms have new tile floors, the interior has new neutral color paint and new neutral carpet. Master bedroom has a retreat and a balcony. Relax there and watch different shows day and night - with absolutely gorgeous sunsets. The master bath is lavish, with a Jacuzzi tub and shower with large windows surrounding them to relax and enjoy the view. The backyard provides a TOP OF THE WORLD sensation.. This is a great home for entertaining. You need to VIEW this home! It is all about THE VIEW !" 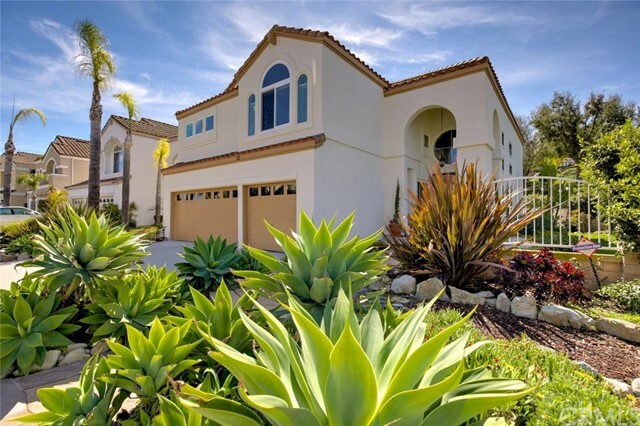 "Welcome to prestigious, guard-gated Canyon Crest-Mission Viejo's premier community. This stunning 5-bedroom, 5-bath home is tucked at the end of a quiet culdesac on one of the neighborhood's larger pool-sized lots. Classic Craftsman-inspired architecture and manicured landscaping greet you as you enter through the peaceful front courtyard. Inside, you'll find soaring ceilings and an open floorplan, accentuated with a designer palette and warm finishes. A downstairs office with French doors has been reimagined as a elegant wine room, ideal for intimate gatherings. The downstairs guest suite offers its own private full bath. There is an additional 3/4-bath on the main floor. The chef's kitchen opens to the family room for ease of entertaining, and has a 5-burner gas range, double ovens, built-in fridge, pots & pans drawers, center island with bar, and a walk-in pantry. Upstairs is a sumptuous master suite with fireplace and dual walk-in closets. Two large secondary bedrooms have built-in desks and share a Jack & Jill bath. A large 4th bedroom is ideal for a theater, game room or bonus room, and is adjacent to another full bath. The rear yard has a terraced garden, built-in BBQ, lawn, covered patio, and surround-sound speakers indoors and out. Plus the resort amenities of Canyon Estates: tournament quality tennis courts, 3 pools, fitness facility, sport court, clubhouse & more. 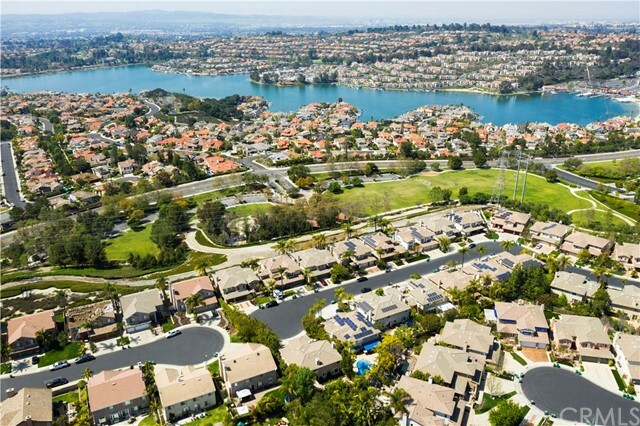 Lake Mission Viejo membership included, with boating, swimming, fishing and concerts. WELCOME HOME!" "Spectacular Pacific Hills Charmer with a Sparkling Pool and Spa located on a private cul-de-sac. Double front porch entry opens to a grand foyer with soaring ceilings and a sweeping staircase. The formal living room and dining room share a dramatic fireplace and dramatic floor to ceiling windows. The fabulous chef's kitchen features white cabinetry, granite counters, large center island, double ovens, gas stove. large pantry, recessed lighting and a breakfast nook. The kitchen opens up to the family room with hardwood floors and a beautifully appointed fireplace. Private entertainment backyard was expertly designed for California living featuring a stacked stone, pebble-tech pool and spa with tropical landscaping. Upstairs the huge master suite is a true getaway with a double sided fireplace in the retreat/bedroom, a large private balcony and an elegant master bath. The highly upgraded bathroom includes an over sized shower, a deep soaking tub, a long vanity with double sinks and an enormous walk in closet. One secondary bedroom includes an en suite remodeled bathroom. The third bedroom has another full bathroom just outside the door. All bathrooms have been remodeled with granite, lighting, floor to ceiling tile, glass shower doors and more. Second floor includes a spacious loft for many uses. Main floor bedroom is currently used as an office. Laundry chute can be accessed from master and loft area. Award winning schools and Lake Mission Viejo membership. Low taxes and HOA." 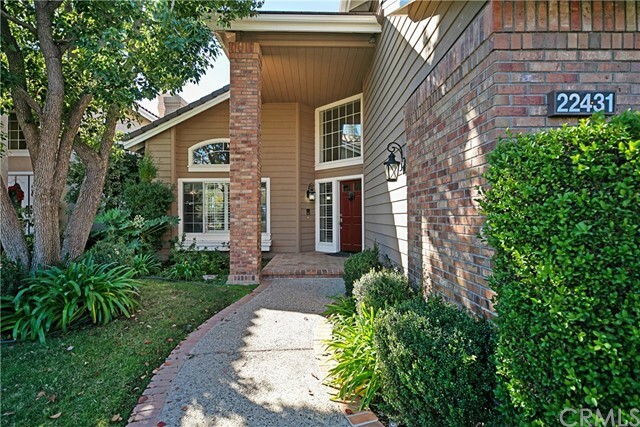 "Lovely Canyon Crest Home on a cul-de-sac street. Enter through the leaded glass entry doors into this home offering 5 bedrooms and 3 bathrooms, large living room with high ceilings and fireplace as well as a large dining room also with high ceilings and French doors looking out to backyard. The gorgeous remodeled kitchen offers granite counters, stainless steel appliances including Sub Zero refrigerator, Dacor professional range and microwave, Miele dishwasher, built-in freezer drawers and warming drawer, center island with utility sink, beautiful cabinetry and cozy breakfast nook overlooking backyard. The spacious family room offers fireplace and sliding glass door leading out to backyard. There is a main floor bedroom and bath as well as a wine bar with wine refrigerator and inside laundry room. Upstairs there is a Master suite with sitting area, luxurious remodeled master bath (counter tops just replaced, photos will be updated) and walk in closet. There are three additional spacious bedrooms including one extra large bedroom or optional bonus room. 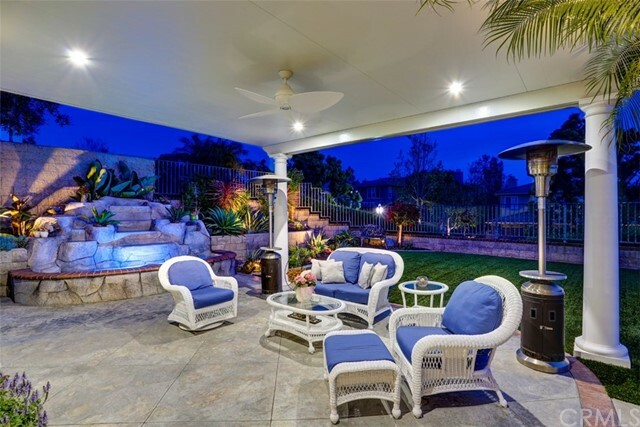 The serene backyard is perfect for entertaining. In addition there is a 3 car garage with built-ins and overhead storage and newer windows. Located near the community clubhouse with tennis courts, pools, spa, tot lot and banquet facilities. 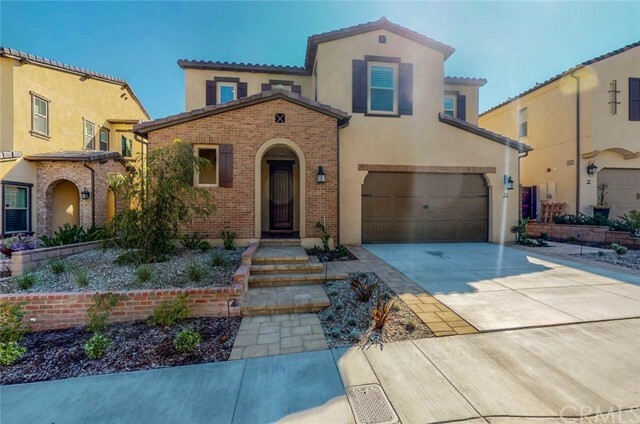 Also, near Lake Mission Viejo offering boating, swimming, fishing and summer concerts." "Welcome home! This stunning Canyon Crest Estates home is exactly what you have been looking for. 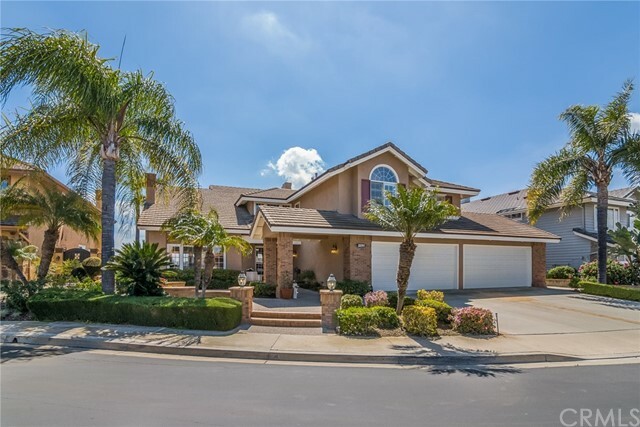 Situated at the end of a beautiful cul-de-sac in a guard gated community, this home features 4 spacious bedrooms with an additional office that could also be used as a bedroom, 3.5 baths within a 3,557 square foot home on a 9,745 square foot lot. The backyard offers endless enjoyment and entertaining possibilities with a beautiful patio complete with salt water pool and spa, a built in BBQ with Island, several dining areas and plenty of room to play. This premium lot is the second largest lot within the community, home also has PEX piping and a newer roof. The beautiful kitchen looks out to the backyard and features a double oven, microwave, refrigerator and built in wine fridge. The enormous upstairs bonus room is perfect for a children play area, movie room, pool table and more. The upstairs also features an office currently used as an additional children play area, 2 large bedrooms and a large master with walk in closet and on suite. The downstairs also features a guest suite with private bath, formal living, dining and family rooms. 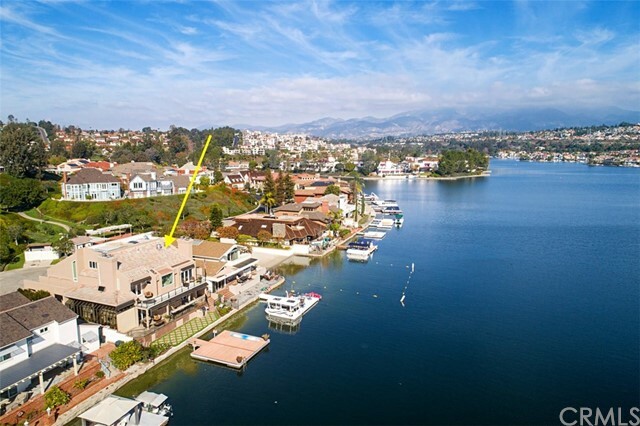 Located within just a few minutes of the beautiful Mission Viejo lake, home to paddle boarding, boating, fishing, concerts in the park and an amazing fireworks show on the 4th of July. Also directly up the street from the Florence Joyner Olympic Park for family fun and both youth and adult sports. You will not want to miss out on this opportunity." "Only minutes to civic center, restaurants, and banks. Situated in the desirable Pacific Hills neighborhood, on the corner of a cul-de-sac, this gorgeous turn-key, spectacular home features whole house repipe with Pex, brand-new kitchen with huge island and brand new appliances, white cabinet, Carrara Quartz countertop and walk-in pantry, dual-zone central AC with one brand new air conditioner, brand new water-resistant laminate wood flooring, brand new carpet, brand new interior painting, brand new plumbing shut-off valves, etc. A convenient downstairs bedroom with a brand new bathroom. Room-size master bedroom closet. Master bathroom features separate oval bath tub and shower with huge brand new vanities and light fixtures. Good size yard with environment friendly artificial grass and fruit trees. 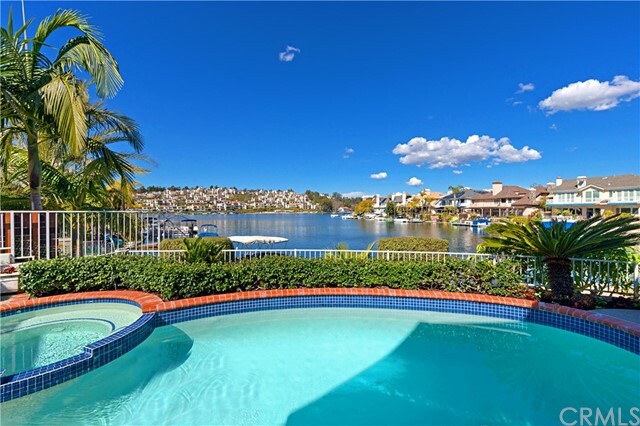 Mission Viejo lake for your vacation style life and entertainment. A must see home!" 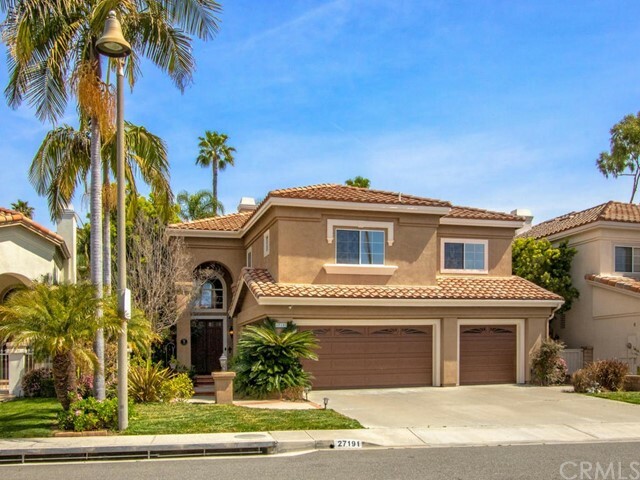 "5 BED, 3-1/2 BA fully remodeled executive home, located in the prestigious Canyon Estates gated community, in north Mission Viejo. Upstairs boast a Giant Master Bedroom and spa inspired Master Bath, featuring LED mirrors, white quarts counters, oversize no curb glass shower and custom cabinetry with extra storage. Also a beautiful soaker tub. Extra outlets and USB connections for your electronics. Large walk in closet is attached to the master bath. 3 additional bedrooms and a dual vanity bathroom features white quartz countertop, wainscoting and a shower tub combo. The massive loft makes for a great game room and home theatre. The kitchen features stainless appliances, dual convection wall ovens and Bosch 5 burner cooktop. Granite counters and backsplash, which opens to the family room. The home features crown moulding, LED can lights throughout. One bedroom with a full bath is located downstairs. There is also a half bath downstairs. 13 foot high ceilings create a grand look and feel. This home has a fireplace in both the front, and family room. The house has a large backyard, patio cover, and dog run on the side. Spacious 3 car garage with an abundance of overhead storage. The home also features a new 16 seer AC unit, and new PEX piping throughout. The home is located within walking distance to parks and the Lake. Canyon Estates boasts some of the lowest HOA fees in the county. The HOA includes state of the art gym, tennis courts, pools, sauna, playground and clubhouse." "Fantastic Customized Pacific Hills Home on a Premium Corner Lot, Highly Upgraded; Move-In Condition! 4 bedrooms, PLUS Loft, Bonus Room, AND Outdoor Room! This wonderful home offers over $200K in upgrades and quality features, by original owners, including: fully owned solar panels, Life Source whole-house water filtration system, Milgard vinyl windows, upgraded kitchen and master bath, brand NEW entry flooring, carpeting, and exterior paint, and fabulous custom additions for added living space! Expansive corner lot sides to greenbelts and low-traffic streets. The exterior grounds include: beautiful meandering gardens, a huge grassy pool-sized yard, peach and lime trees, gardening beds, and an outdoor room with lighting and a large sit-around BBQ island. Double door entry opens to a grand foyer, with steps down to formal living and dining rooms. The granite island kitchen and family room with fireplace open to additional living space in the outdoor patio. This patio structure is extremely strong and includes a full Spanish tile roof to match the house! The master suite upstairs is enormous- and includes a giant walk in closet (w/another one in the bathroom) and an added room- currently used as sleeping quarters. (Gym, office, nursery?) Master bath was remodeled to perfection- with lavish use of sumptuous quartzite. There are three additional bedrooms upstairs, a full bath with double sinks, and a loft! Lake Mission Viejo privileges, no mello roos, low HOA s. This is Home!"